Pune City had registered a convincing 1-4 victory against the defending champions in Kolkata and many believed ATK would seek their revenge. Image Source : ISL PC Pune City players celebrate after scoring. 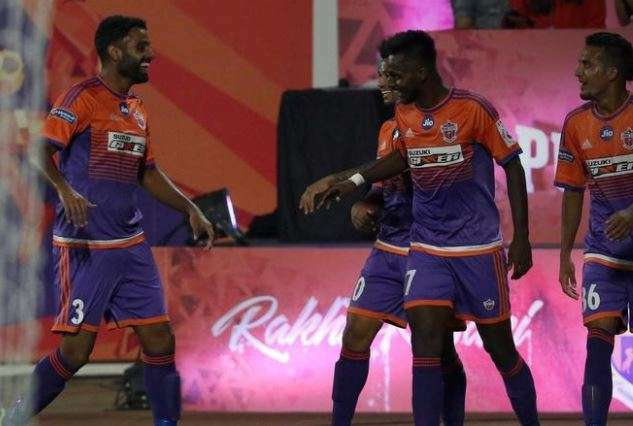 FC Pune City continued their march towards securing a place in the Indian Super League (ISL) playoffs with a "double" over Atletico de Kolkata as they scripted a comfortable 3-0 victory at Shree Shiv Chhatrapati Sports Complex Stadium on Saturday. Pune were dominating and were quick on the counter-attack as goal machine Marcelinho was constantly on the run, tormenting the Kolkata defence. Pune City had registered a convincing 1-4 victory against the defending champions in Kolkata and many believed Atletico Kolkata would seek their revenge. That hardly happened and instead, it were Pune City who embarrassed Atletico de Kolkata again with a comfortable victory. Adil Khan (32nd minute), Diego Carlos (59th minute) and Rohit Kumar (77th minute) scored for Pune City as they got the goals despite their goal-machines, Marcelinho and Emiliano Alfaro, not getting on the scoresheet. The victory takes Pune City to 19 points from 11 matches and consolidates their third position on the table. Atletico de Kolkata, on the other hand, have 12 points from 10 matches and are placed a disappointing ninth. Pune City led by a solitary goal in the first-half as they dominated for the most part and created plenty of difficulties for the visitors. Marcelinho and Alfaro were a constant threat and had Alfaro not missed a sitter, they would have been ahead early in the game. In the 19th minute, Diego Carlos served the ball on a platter for Alfaro to head home but the striker missed from point-blank range. Fortunately for Pune, that miss did not come to haunt them as Adil Khan broke the deadlock in the 32nd minute. A wonderful delivery from Marcelinho saw Adil rise high above the rest inside the box and finish off with a superb header for his fourth goal of the league. Atletico de Kolkata were surprisingly subdued and did little to fight their way back. Zequinha's effort that went straight to the goalkeeper was the closest that they got and then there was the attempt from Conor Thomas which was cleared on the goalline by Jewel Raja. In the second session, Pune City took control and got the goals that took the match away from Atletico de Kolkata. The second of the night came in the 59th minute and was a terrific effort from Diego Carlos. The winger got hold of the ball from almost the halfway mark and dribbled past a couple of players before firing home from outside the box. It was a perfect finish, giving Atletico de Kolkata goalkeeper Debjit Majumder no chance. Debjit was left stranded again in the 77th minute as Pune scored their third. It was another high-quality goal from the youngster who collected a pass from Sarthak Golui, then took his time and picked up the bottom corner.